Gondola Haus at Mountain Lodge. Ski In Ski Out, Pool, Hot Tub, and Views! Once your car is unpacked and resting in the heated garage, you won't need it again until it's time to go back to the real world. A significant element of Telluride's charm is its free year-round gondola transportation network. Walk up to the Mountain Lodge lobby and enjoy a warm fireplace, a cold drink, or a dip in the all-season swimming pool. Once in the lobby, grab the Mountain Lodge's free shuttle to the Mt Village Core or to the Grocery store/ gondola plaza which offers a coffee bar, a well-stocked liquor store, the town post office and a gondola station. From here, it is a 3 minute glide to the heart of the Village core, another 4 minute ride to Allred's Restaurant at the top of the ridge, and 11 minutes more to the town of Telluride. Go ahead—enjoy another glass of Pinot at La Marmotte, and rest assured the gondola will deliver you safely and silently back to your front door to end another incredible evening. In the winter, pull your ski boots on in front of the in-unit fire place and walk approximately 100 yards to the Double Cabins ski access (a green run). Once there, slide down to Lift 10 or Lift 1 and start your ski day. If you end up skiing into the Village Core or into the town of Telluride, you can ride the free gondola back to the Mt Village and call for the free Mountain Lodge shuttle. Telluride deserves its reputation as having the most dramatic views in Colorado. The ski mountain is huge with acres of skiing for every ability. Excellent skiers will find new challenges and Lift 10 provides new skiers with miles of gliding. Telluride's free gondola transit system is unique. It runs from 7:00 in the morning until mid-night and beyond. The gondola station across the road provides a 3 minute ride to the center of the Mountain Village or a 15 minute ride over the 10,500 foot ridge and down to the town of Telluride in the valley below. King sized bed, gas fireplace, flat screen tv. En suite bathroom shower and tub in the glass shower, and vanity. 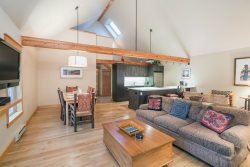 Comfortable living space with gas fireplace and flat screen tv, kitchen with high-end appliances, bar seating for two at the island, dining table with bench style seating. Concierge services are available to all Latitude 38 guests. Pets's Allowed with Pet Fee and Pet Wavier signed.